Neighbors who habitually allow their pets to roam freely around the neighborhood can be very frustrating. Whether the animal is just doing it's business in your yard, causing some kind of damage to your property or frightening your family, pets and other wildlife; dealing with the situation correctly from the beginning can help to ensure that you resolve the issue with the least amount of conflict possible. Try to understand what the issue is. In some cases, the neighbor does`n't even know that their pet is leaving their property. A hole in their physical fence, an irresponsible child at home or an issue with their invisible fence could be at fault. These failures actually happen more often than you think without the owners knowledge and the pet returns to the property before the owner even knows it was missing. In these situations, simply alerting the neighbor to the issue is most often all that is needed to resolve it. 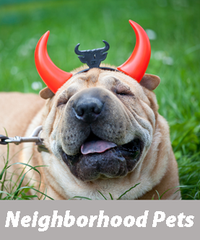 Often, the neighbor simply doesn't care how his pet roaming the neighborhood negatively affects his neighbors. Most of the time, it's difficult and error prone to try to judge someone's intentions. So, unless you know for a fact otherwise, it's best to give your neighbor the benefit of the doubt. Don't create an enticing environment for their pet. Pets will come into your yard for many reasons: they consider it an extension of their territory, to get food, to find things to play with or even just exploring while they pass through. A great place to start your effort of deterring unwanted guests is to remove those things that make it so inviting for a roaming pet: accessible trashcans, dog dishes or other food sources as well as chew toys (or things that inadvertently become them like a Frisbee). It's tempting to do something retaliatory at this point like throw it into your neighbors yard; or, the worst advice I've seen, package and deliver it with a note to your neighbor's doorstep. It's important to focus on resolving the issue with the least investment of your time. Creating a conflict will make your neighbor much less resistant to finding a joint resolution and could create other more personal problems in this very important relationship. Unless the temporary feeling of being avenged is worth having 10x worse offenses committed by your neighbor against you in the future, avoid retaliation and let a cooler head prevail. Many dogs are "nose to the ground"- meaning they are more interested in following a scent than what they see or even hear. For these kinds of dogs, a very effective deterrent is to use one the above repellents around the perimeter of your property- particularly where the dog tends to enter your property. Be careful to follow the directions and, even if the directions don't say this part, ensure that you test a spot on your yard to be sure that it won't kill your grass before drawing an obvious line around your property. As a less expensive option, you may also want to buy black or cayenne pepper powder and use it as a perimeter. This product tends to wash away faster (the first rain or a heavy dew) as opposed to some of the products designed to last longer (several weeks in some cases). Often, conversations between neighbors can be strained because there is an assumption that the offending neighbor is intentionally creating a problem; when they are, in fact, unaware that what they are doing is an issue. Bringing it to their attention without asserting malicious intent can often lead to a faster resolution and a better relationship going forward. Particularly if they agree rather quickly in the conversation to correct the issue, be sure to not drone on about it. Thank them for understanding and move on to other unrelated, more pleasant conversation- only returning back to the topic if they do. If the discussion with your neighbor doesn’t yield results, you will need to consider your options for escalating to the next steps. The first escalation should be to formalize your request in writing. Be polite but direct about what's been happening and what exactly you think they should do about it. Reference the original verbal conversation and the date you had it; and ensure that the date you are sending the letter is noted on the letter itself. Keep a copy of the exact letter sent to them. As the saying goes, "Tall fences make good neighbors". In this case, an assured way to keep the neighbor's pets out of your yard is to physically block them with a fence. If you also own pets, having a fence to keep them in and other's pets out could make the most sense. If you don't own a pet, it really isn't your responsibility to put up a fence (but it always remains your option). Rather it is the pet owner's responsibility to leash or otherwise contain their animal and you can ask your neighbor to do so. Contacting the Police or Animal Control. If the situation is not resolving through conversation or formal requests between you and your neighbor, it is time to escalate to the next level. You will want to avoid a, “your word against theirs” situation when calling the police or animal control. Firstly, you need to keep a log of the behavior(s) of both the neighbor and the pet. This can be done electronically or on paper. You will also want to have proof of the behavior for discussion with the police or animal control. Using a standard security camera may act as both a deterrent (your neighbor knows that you are getting serious and may begin controlling her pet more aggressively) and as proof of the behavior. If you suspect that your neighbor is playing a part (observable negligence or deliberately bad behavior), an alternative approach (or in combination with a standard security camera) involves the use of to catch the person in the act.